Don't miss the very first Regional Arbitration Conference by the Lagos Court of Arbitration on 5 November. You can register on their website at www.lagosarbitration.org. This summary is fully reported at (2013) 8 CLRN. This summary is fully reported at (2013) 8 CLRN (forthcoming). This summary is fully reported at (2013) 7 CLRN. A claim for interest on an ascertainable sum is a liquidated money demand. Read more about A claim for interest on an ascertainable sum is a liquidated money demand. Save the Date: Disputes Arising! 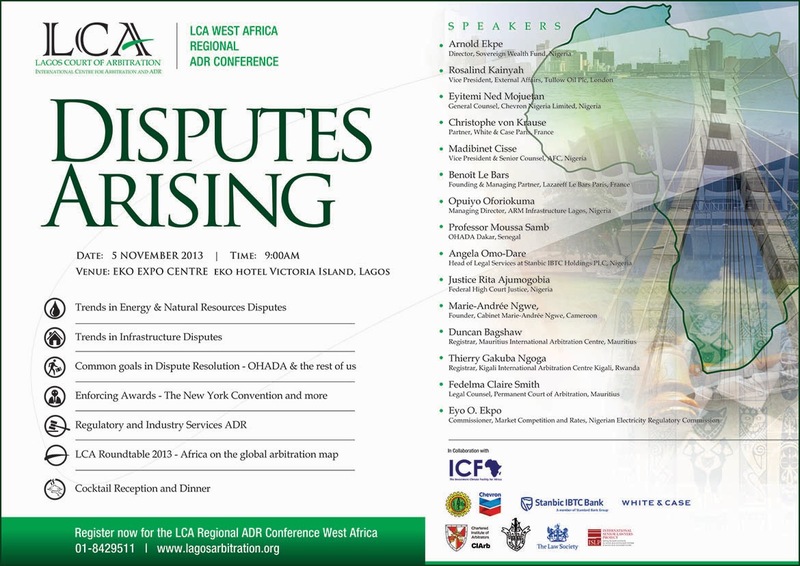 The Lagos Court of Arbitration is hosting it's regional ADR conference on Tuesday 5 November, 2013 at the Intercontinental Hotel, Lagos, Nigeria. Read more about Save the Date: Disputes Arising! This week, the Court of Appeal upholds the sanctity of arbitral clauses and protecting them from undue interference. This summary is fully reported at (2013) 7 CLRN (forthcoming). STATOIL (NIGERIA) LIMITED & ANOR. v. NIGERIAN NATIONAL PETROLEUM CORPORATION & 3 ORS. This summary is fully reported at (2013) 6 CLRN (forthcoming). Boiling over - watch those standard clauses in energy contracts! In contract negotiations, commercial persons and their attorneys indeed focus on the business terms and conditions of their contracts or agreements and would typically spend little or no time addressing the “boilerplate” provisions typically found at the end of such contracts or agreements. Read more about Boiling over - watch those standard clauses in energy contracts!